I love college radio but couldn't find a decent way to listen online. Sure there's iTunes and shoutcast.com, but it can be hard to find actual college stations among everything tagged "college". And I don't like being restricted to their interfaces. And there's been a few times where I wanted to make a radio tuner application, either web-based or standalone, but got discouraged by having to do all the legwork. 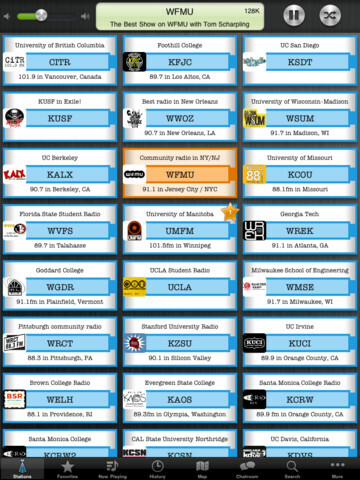 Thus goodradio.org was born: as an easy way to both listen to great college radio stations and build applications to listen to them. Here's a our iPad app, which thoroughly rocks. It lets you play all our stations in a jukebox interface, as well as on a Google map. Trigger Finger is a Windows jukebox style interface to play all our stations. Works fantabulously on a touchscreen. Here's a google map plotting all the best college and non-commercial radio stations using the actual GPS coordinates of their transmitters as listed in the dreaded FCC database. Right-click a station (the tower icon, not the label) to stream it directly, or left-click to see a bubble with a bunch of info including studio phone number, online archives, homepage, etc., and zoom all the way in to see the tranmitter antenna. Or if you want to make an application that tunes into college and/or non-commercial radio, here's some stuff to get you started. 1/4/10: Added the streaming updates above. 11/21/08: The site got a sprucing up.